The disaster struck Conway, South Carolina, resident Jess Porter last Wednesday. It's been 11 days since Hurricane Florence first barreled through the Carolinas, but the devastating floods are far from over. Disaster struck Conway, South Carolina, resident Jess Porter last Wednesday. The unprecedented rainfall had already ended, but that's when the rivers "shot up so fast" and her home filled with more than three feet of water, she told ABC News' "Start Here" podcast Monday. The family rushed to their house in a boat to grab some of their belongings. Then Porter, who is pregnant, evacuated with her husband and 2-year-old daughter. The family is staying in nearby Myrtle Beach waiting for the water to recede. (Sean Rayford/Getty Images) People navigate floodwaters caused by Hurricane Florence near the Waccamaw River, Sept. 23, 2018, in Conway, South Carolina. 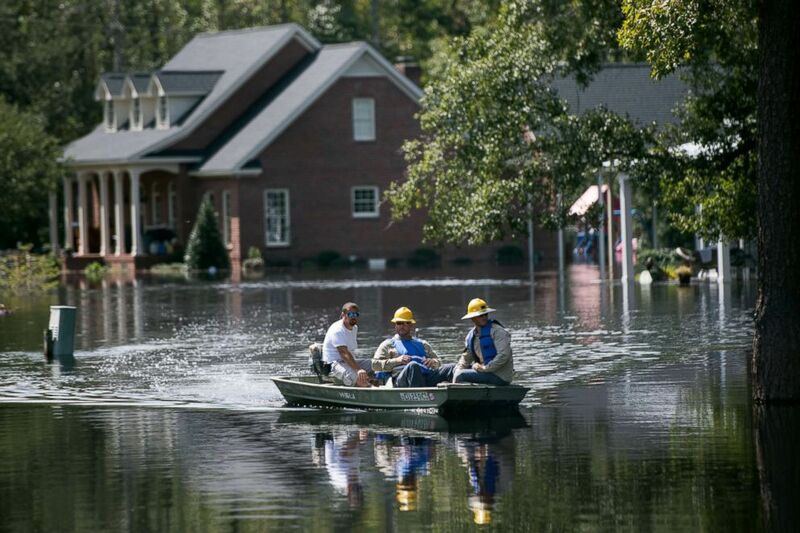 (Sean Rayford/Getty Images) A man checks his phone while helping friends rescue valuables from a home inundated by floodwaters caused by Hurricane Florence near the Waccamaw River, Sept. 23, 2018, in Conway, South Carolina. "We tried to bring what we could here of hers, just to make her comfortable until we can get somewhere to call home again," Porter said. "It's such a devastating and gut-wrenching feeling to know that there's absolutely nothing you can do to fix it." Florence is "the worst disaster" the city has "ever seen," City of Conway officials said on Monday. 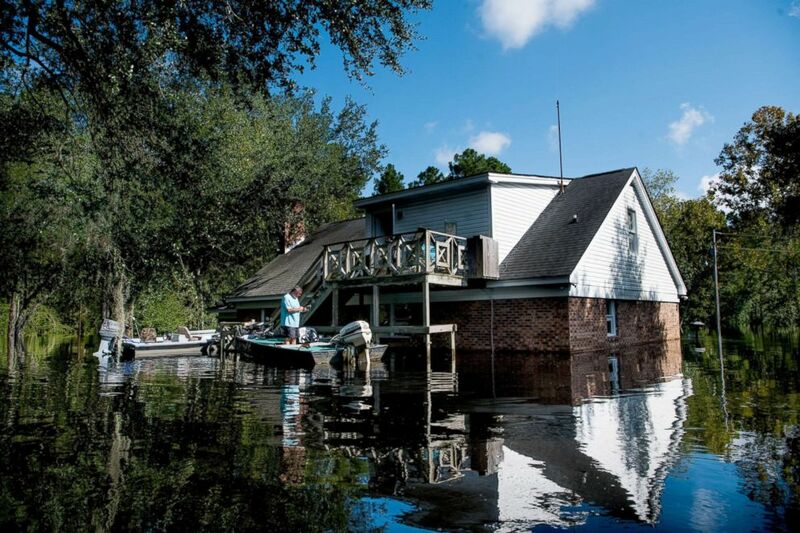 In Horry County, which encompasses Conway, the Waccamaw River crested at a record level of 20.22 feet this weekend, more than 2 feet higher than during Hurricane Floyd in 1999 and more than 3 feet higher than it did two years ago for Matthew. About 21,000 people in Horry County could be affected by the flooding, county spokeswoman Kelly Moore told ABC News Tuesday. "We knew that we were going to have some type of flooding because we have experienced this before, but nothing, I mean, I've never in my life seen anything like this," Porter said. "We weren't prepared to have this amount of rain or water in our homes." At least 43 people, including several young children, have died as a result of Florence, which brought unprecedented rainfall and flooding to North and South Carolina. Roads may be impassable in Horry and Georgetown counties this week and extra law enforcement resources have been dispatched to both counties, the South Carolina Emergency Management Division said Monday. This story appeared in the Tuesday, Sept. 25, 2018, episode of ABC News' daily news podcast, "Start Here."